Home / Posts tagged "Triarii"
A special welcome to a night of bombastic darkness in a place rarely to be seen within the frames of alternative music. The former church known as Skeppsholmskyrkan, now Eric Ericsonhallen, is the venue perfect to host this kind of event. Majestic, gothic and with outstanding and complicated acoustics that will surely add an extra layer to an evening that will be a once in a lifetime experience. 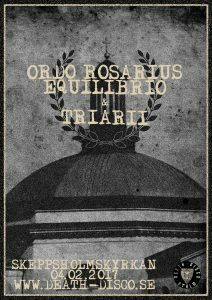 Ordo Rosarius Equilibrio (Official) is performing a show in Sweden for the first time since 2003. A legendary band that started out with the legendary label, Cold Meat Industry, in 1993. Instantly they found their own sound that can be described as apocalyptic folk music and since 1995 when the debut (Reaping the fallen/The first harvest) came out they have released 14 albums. The new album “[Vision: Libertine] – The Hangman’s triad” released in early 2016 is the first since 2010 and for sure one of the best they ever released, probably even the darkest one.